An interesting complication is that the climate is not always the only stable state. Keeping all the conditions unchanged, a close to current climate can be tipped into a snowball state when the solar insolation slightly decreases. This may be easily understood by simply considering the albedo (reflectivity) of the ice. Ice has a much higher albedo (about 0.6) than seawater (about 0.2), so a snowball Earth is able to reflect much more radiation and maintain the temperature below the freezing point. There is a tipping point as the solar insolation decreases, the climate suddenly transitions to global glaciation, referred as the snowball bifurcation. In today’s paper, the authors investigate the snowball bifurcation on habitable tidally-locked planets compared to Earth. Figure 1. Sine of the ice latitude as a function of solar insolation for the energy balance model on an Earth-like planet. The solid line corresponds to stable solutions, and the dashed line corresponds to the unstable solution. A bifurcation occurs when stable and unstable solutions join. The authors first apply a simple 1D energy balance model, which allows us to derive analytical solutions and understand the underlying mechanisms. 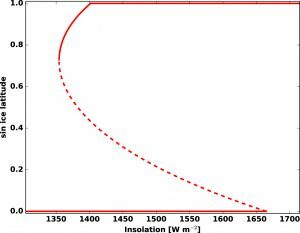 The model describes the balance between solar insolation, outgoing radiation, and the heat transport. 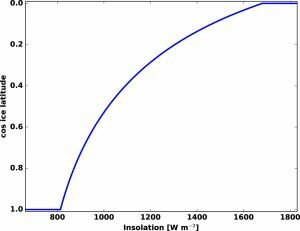 One can obtain the relation for the solar insolation as a function of the ice latitude (the latitude where water begins to freeze), as shown in Figure 1. The y-axis is the sine of the ice latitude, so 1 means ice-free and 0 means fully covered by ice. The solid line shows the stable solution and the dashed line represents the unstable solution. Depending on the direction of the external perturbation (heating or cooling), the unstable point will jump to the ice-free state (top line) or the snowball state (bottom line). For example, for any point on the dashed line, when insolation drops a little, the ice latitude correspondingly moves toward the equator, but it has to move all the way down to the bottom line to reach a steady state. This is due to the positive feedback of ice-ocean albedo contrast: Due to the higher albedo of ice, once in the unstable region, decreasing insolation leads to more ice built up and reflects more sunlight, and hence in turn forming more ice. The joint of the stable and unstable solution marks the beginning of this bifurcation. In the bifurcation region, which steady state the climate will end up is determined by the initial condition. Figure 2. Cosine of the ice latitude as a function of stellar insolation for the energy balance model in a tidally locked configuration. There is only a stable solution, and there are no bifurcations under the chosen parameters. Many habitable planets, like Proxima Centauri b and TRAPPIST-1 e, f, are found around M-dwarf stars since they are the most common stellar types. The potential climate state on these worlds is naturally of great interest. Working out the same exercise to the tidally locked planets, the authors find that due to the geometry of insolation (the position of the star is fixed), it is somehow more difficult to have a snowball bifurcation than Earth. Figure 2 shows the same solution from the energy balance model but for a tidally-locked planet. The ice latitude change is smooth and there is no bifurcation. Only when the heat transport is very strong, there will be snowball bifurcation (not shown). Figure 3. Global mean surface temperature (A, C) and sea ice fraction (C, D) as a function of insolation for the tidally locked (A, B) and Earth (C, D) configurations. Blue stars correspond to a Cold Start (ice-covered planet) initialization and red stars to a Warm Start (ice-free planet) initialization. The red line corresponds to the warm Earth state, the blue line corresponds to the Snowball Earth state, and the gray dashed lines correspond to the unstable states (C, D). Figure 4. Example states of equilibrated surface temperatures for the tidally locked (A) and Earth (B) configurations. 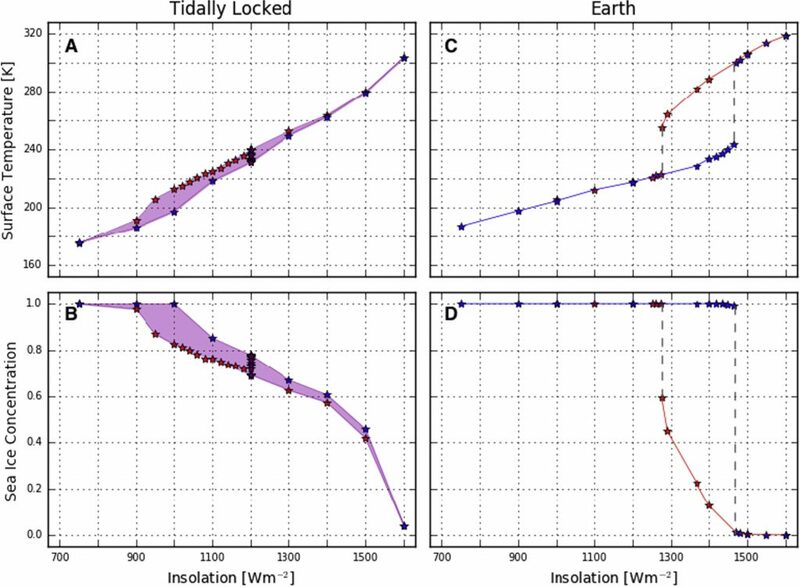 The authors testify this analysis by running simulations including the thermodynamics of sea ice and clouds. The results confirm the energy balance model. One can see that opposed to Earth, the steady state on a tidally-locked planet almost does not depend on the initial condition (the small deviation in the purple shaded area in Figure 3. is found due to artifact). In addition, clouds tend to form near the sub-stellar point (Figure 4). Because clouds have a higher albedo than seawater, it reduces the ice-sea albedo contrast, making the system more stable and less plausible to have snowball bifurcation. This work implies that we have a higher chance of finding “actual habitable worlds” planets for tidally locked exoplanets, since they are unlikely to be locked into a snowball state. An interesting future work would be including silicate weathering and investigating the case of planets with larger orbits and not being fully tidally locked. Habitability Whether Rocks Weather or Not? Could Mars have experienced a colossal global warming? Shooting for the Stars (and damage of doing so) What do you have to do to get a water covered planet around here?